Please click on a thumbnail image below to view a larger version. The Four Star Hotel Antica Dimora alla Rocca offers panoramic rooms with wooden ceilings , all equipped with: air conditioning with individual control , minibar , digital safe , direct dial telephone and internet connection , TV/SAT; marble bathrooms with jacuzzy hydromassage bat-tub or shower , hairdryer , towels-warmer. "Noble Floor" with spacious de luxe rooms with frescoes ceilings ; Penthouse Regal Suite: sitting room with sofabed , 2 bedrooms and 2 marble bathrooms with Jacuzzi bathtub. 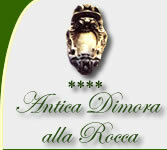 Hotel Antica Dimora alla Rocca!